Mary Green enjoys the sights and smells of early autumn. I have had some walks along the canal with people from the Canal and Rivers Trust looking at the regeneration of vegetation after the towpath works and the railway station work in Alvechurch. They acknowledged that there was over-mowing in the summer, and I hope they will be able to keep to their good mowing regimen now they have got it sorted. The patch by the canalside over the road from the station, which was stripped and used as a car park by Network Rail, they hope to maintain as a wildflower patch with the addition of a couple of native fruiting trees. It had an amazing variety of flowers in late summer. If they get this right, wildlife should thrive. At the station, the tansy finally came back and was spectacular. The young swallows flew the nest by the canal and I saw them flying about for a while, then collecting on the wires. One of my neighbours has told me that what I thought was a young or female mandarin duck is more likely a wood duck. Having looked it up I think he may be right. The wood duck is American and occasionally escapes from collections here, though not as often as its relative, the mandarin, which is well established in England. October is often known as the golden month, with the leaves turning, and sometimes lovely sunshine still. Around October 18, St Luke’s Day, there was traditionally expected to be a spell of fine warm weather called St Luke’s little summer. Over the last few years we have had sunny and mild weather around that time, so maybe it’s true. In America the same phenomenon is called an Indian summer, and we use that term too now. It’s about this time that the field maples turn yellow, and one on the hill opposite my house turns red instead. Most native maples’ leaves become yellow but for some reason a few become red. In early October we can generally enjoy the colours and earthy scents of autumn without feeling the chills of winter coming. The reds and yellows are the “true colours” of the leaves exposed when the chlorophyll is taken back into the tree for winter. The first two weeks of October were a common time for local fairs. Most of these were traditional Michaelmas fairs. Michaelmas is September 29, but when the calendar was moved forward by two weeks in the 18th century many places stuck to the old times. Some of these, like Tavistock Goosy Fair, were huge events drawing people from miles around. Our Mop Fair in Alvechurch is a pale reflection of an old custom! These fairs and St Luke’s fairs made this time of year a favourite time for celebrations. St Luke’s symbol was a horned ox, and horns figure strongly in the themes of these celebrations. By the end of the month things are different. This is the time for all the ancient festivals of the dead – Halloween, Samhain, All Saints and All Souls – when the spirit world is thought to intrude on the earthly world and the veil between them to be very thin. This didn’t have the ghoulish and scary connotations that Halloween seems to have today, but was more an opportunity to get close to the spirits of the departed. Like the other quarterly Celtic festivals, it marks a transition in the year (autumn to winter in this case) and was celebrated with fire. The day before All Hallows’ (All Saints’) Day was called Hallows’ Eve or Halloween, and was celebrated from early Christian times. It was originally at a different time of year but was moved to the autumn, possibly to replace the pagan festivals of that time. One of its traditions was called “mischief night” and was a time when people (especially children) felt free to be naughty without repercussions. There is quite a tradition of these “lawless days” at various times of year: I remember one from the town near where I grew up when there was a (mistaken!) belief that normal laws didn’t apply on the day of the annual fair. Mischief night at the end of October survived longer than some of the others, but in the 20th century became attached to the day before Guy Fawkes Night instead. This was a very northern tradition in England, and I remember it well from my days living in Leeds in the early 1960s when kids were extremely mischievous on that night! By that time celebrating Halloween had almost disappeared in England. Of course, 50 years on, the American tradition of Halloween has reversed this again, and kids no longer do their mischief for Guy Fawkes. Both St Luke’s and Halloween were divination times to see who you were destined to marry, and there were various methods of doing this. One of them was with apple peel: you had to peel it all in one piece and throw the peel over your shoulder, when it fell in the initial of the man you would marry. Apples of course also feature in the apple-bobbing games of Halloween, which have been going for centuries and reflect the fact that this is the time of abundant apples. In recent times, “apple days” have become a new part of the country calendar. A newer October ceremony is putting the clocks back to mark the end of British Summer Time. For many of us this is now the start of winter as the “nights start drawing in,” and fits in with the older festivals which marked the coming of the darker season. Around this time the seeds have all been gathered for use and the next year’s harvest. It was a difficult and late harvest this year, but the fine spell in September helped. October was “thrashing” time on the farm I grew up on, when the corn which had been stacked was threshed to remove the mature seeds. It used to be a joint effort when people from neighbouring farms all worked together to help each other in turn. I can remember the men all gathered round our huge kitchen table to eat while us kids were banished to another room. In earlier centuries at this time people used to make a special cake with some of the grain, a “seed” cake or “soul” cake. These were associated with the Halloween, All Saints and All Souls season, making them a time with the promise of rebirth as well as death. 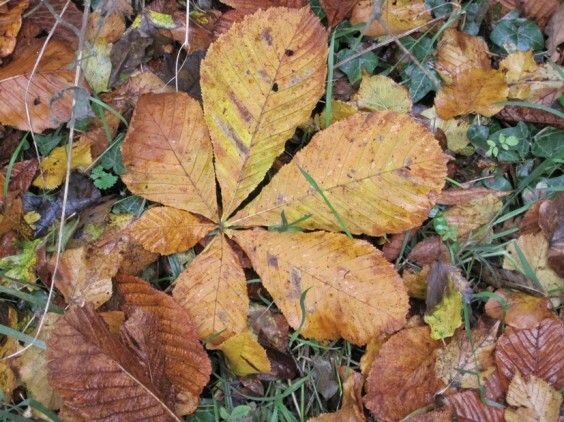 By this time most of the leaves have fallen and the process of decay has begun. This is vital for next year’s growth. It is a key time for fungi, which grow and feed on the dying vegetation and break things down: together with the work of worms and insects, this helps everything to be taken into the soil. Walking through a wood at this time is a pleasure for all the senses. The forest floor is covered with leaves and brightly coloured fungi, all of which will form the basis of new life. There are not many native flowers blooming by October, though some of the summer flowers will still be going in a mild autumn. There are two locally which flower really late in the year. One is the bur marigold which grows by the canal and starts to flower in September. It is quite uncommon and a delicate plant which has suffered in the recent changes to the towpath, but there is still some left. The other is one of the most common plants, the ivy. Its flowers provide some nectar for the latest butterflies, and its berries come very late. Ivy flowers have a very pungent smell which is part of the smell of early autumn. Seeds and berries are one of the dominant features of our hedges and fields now. Birds find plentiful food from both, and it’s important that in our countryside management (and gardening!) we don’t cut them down before the seeds are formed and the berries over. The birds also spread them, and start the growth for next year. So these too will form part of the lovely mulch that autumn leaves contribute to under trees and hedges. It looks as if there will be a good crop of acorns this year. There are even some walnuts in the area which look to be cropping well. Sloes are especially good this year, and will be ready now to pick for sloe gin. People are still fearful of fungi, and rightly to some extent because many are fatally poisonous. But they have always formed a big part of the country diet. Field mushrooms are so familiar that we usually recognise them. There are a few fields round here that are sufficiently undisturbed to grow them, and they even appear on some roadside verges. Our local woods have the highly edible boletus (cep) and the equally delicious little amethyst deceiver – some of the few I can recognise! Lawns and waysides have the shaggy cap, edible when young. I suppose the most recognisable is the fly agaric, the good old red and white spotted toadstool of our fairy story books, which is highly poisonous. But the whole of the earth around us is full of fungi of one kind and another. It’s only when the fruiting bodies come up on the bigger ones that we notice them. I shall be visiting the little wooded ridge out of Barnt Green on the Blackwell road to see if the fungi there, which used to be profuse, have survived the changes made in cutting down trees to protect the railway cutting. In the late summer I visited another much changed wood. In Newbourne Wood, our local Wildlife Trust site, a whole swathe of new native trees were planted last Christmas to replace the non-native conifers which had been cut down. They are going great guns, and lots of different flowering plants were growing round them. These will change as the trees grow, and I guess it will be a while before the fungi come. I hope we get some St Luke’s little summer this year, and that you can enjoy a colourful golden October. And summer’s green a lie: gold is the truth. And then I won’t have birthdays any more. Later every day and every minute. And more the leaves’ turning and spring birdsong. Down to the end of my days in a whirl of red and gold.